"serrate." YourDictionary, n.d. Web. 18 April 2019. <https://www.yourdictionary.com/SERRATE>. Having a saw-toothed edge or margin notched with toothlike projections: serrate leaves. Forming a row of small sharp projections resembling the teeth of a saw: serrate teeth. Having tooth-like projections on one side, as in a saw. Many click beetles have serrate antennae. 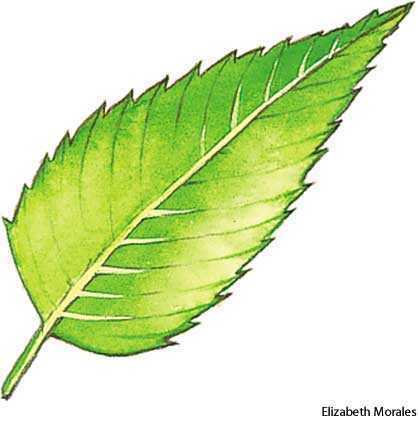 (botany) (leaves) Having tooth-like projections pointed away from the petiole. Serrate is used in some scientific communities; for common usage, serrated is typically the more appropriate term. From Latin serratus, past participle of serrÅ. Leaf margins are finely serrate which give a look of a tooth, have a smooth upper surface but its lower surfaces are a bit prickly. Most saw-fly larvae devour leaves, and the beautifully serrate processes of the ovipositor are well adapted for egg-laying in plant tissues. The members of the genus are possessed of the following characters: - Bark often papyraceous; leaves deciduous, compound, alternate and imparipinnate, with leaflets serrate or entire; flowers in racemes or panicles, white, green, yellowish or pink, having a. They are as a rule of a very hardy character, thriving best in northern latitudes - the trees having round, slender branches, and serrate, deciduous leaves, with barren and fertile catkins on the same tree, and winged fruits, the so-called seeds.